The mission — to help save and preserve life, prevent and alleviate human suffering and safeguard the integrity and dignity of populations affected by crises — is fulfilled through humanitarian assistance 3 and civil protection operations 4 . EU humanitarian aid is a lifeline for communities and victims of new, recurrent and protracted crises. It allows them to prepare better for future emergencies. Complementary civil protection operations offer immediate support in the form of expert teams, rescue equipment and real-time monitoring of developing disasters, in the EU and elsewhere. When disaster strikes, timely and effective intervention by the international community can make the difference between life and death. Together with the Member States’ contributions, the EU is a world-leading donor. This assistance — based on Articles 196 and 214 of the Treaty on the Functioning of the European Union (TFEU) — is a fundamental expression of European solidarity. The year 2015 saw a continuing surge in humanitarian crises. Around the world, armed conflicts and attacks on civilians increased at an alarming rate. Natural disasters, exacerbated by climate change and population growth, are also occurring with increasing frequency and intensity. With over 60 million 5 forcibly displaced people in the world, protracted displacement has become a major humanitarian, development, political and economic challenge. Needs are increasingly outweighing resources and the delivery of humanitarian aid and civil protection is becoming more complex. Given these unprecedented circumstances, the EU has responded by targeting humanitarian aid to the people most in need and most vulnerable, and by upgrading its policy response. Through the EU Civil Protection Mechanism, the EU has also ensured a well-coordinated response at European level to victims of natural and man-made disasters in Europe and elsewhere. In 2015 the EU provided humanitarian and civil protection assistance of over EUR 1.5 billion. This served to help more than 134 million beneficiaries caught up in natural disasters or conflict in over 80 countries. The 2015 humanitarian budget — the largest ever executed by the Commission — was a response to the ever increasing frequency and severity of natural disasters and other humanitarian crises. Syria is the largest ‘source country’ of refugees currently arriving in the EU. The Syrian conflict has continued unabated into its fifth year and remains the biggest humanitarian and security crisis in the world. In 2015, more than EUR 370 million was allocated to life-saving operations in Syria and neighbouring countries. In addition to helping displaced populations in their countries of origin, emergency humanitarian interventions were funded in transit countries, notably the Western Balkans (EUR 22 million), in favour of vulnerable refugees, asylum seekers and migrants. Hungary, Serbia, Slovenia, Croatia and Greece activated the EU Civil Protection Mechanism when they required immediate material support to cope with the refugee influx. In 2015, humanitarian aid to Iraq was significantly increased, with up to nearly EUR 79 million of the EU budget allocated to one of the most rapidly unfolding humanitarian crises worldwide. The protection of civilians is one of the main challenges. Iraq is also hosting almost 250 000 Syrian refugees. Funding for the Sahel amounted to EUR 229 million with a focus on the food and nutrition crisis. Recurrent food crises in the Sahel have severely eroded the resilience of the poorest families and have forced hundreds of thousands to leave their homes. Conflicts in Mali, the Central African Republic and northern Nigeria — spilling over to Chad, Niger and Cameroon — have further exacerbated the food security situation. Continuous armed conflict in South Sudan, a Level 3 emergency, has uprooted millions and generated huge humanitarian needs. EU funding, reaching EUR 127 million in 2015, has supported life-saving activities in South Sudan and helped the South Sudanese refugees in neighbouring countries. The EU announced in December 2015 a contribution of EUR 125 million to finance emergency actions in countries affected by the extreme weather phenomenon ‘El Niño’ in Africa, Caribbean, Central and South America. Targeted disaster risk reduction and local capacity building actions are supported in areas presenting high local vulnerabilities. In July 2015, the UN classified the Yemen crisis as a Level 3 emergency. EU humanitarian funding, which reached EUR 50 million in 2015, targets both Yemen’s internally displaced people and its refugees. Conflict combined with poverty, forced displacement and rising food prices have aggravated an already serious humanitarian crisis. Yemen is also directly affected by the humanitarian crisis in the Horn of Africa. Millions of people in Ukraine are in need of humanitarian aid because of the conflict in the eastern part of the country. EUR 30 million from the EU budget was allocated in humanitarian and early recovery aid to the people of Ukraine. In addition, in-kind assistance was provided through the EU Civil Protection Mechanism. EUR 15 million in immediate humanitarian relief was provided to the victims of the Nepal earthquake, in addition to the deployment of civil protection experts, search and rescue and first-aid teams, and relief items, sent under the EU Civil Protection Mechanism. Education in emergencies became a major policy priority in 2015. Education is a life-saving humanitarian intervention in a context of such significant forced population movements last year. In 2015, more than 1.5 million children benefited from education in emergencies' support. In 2015, the EU Civil Protection Mechanism was activated for 25 emergencies (pre-alert, monitoring and request for assistance) and received 19 requests for direct assistance within the EU and in other disaster-stricken countries. 2015 also saw the most successful edition of the European Civil Protection Forum, the large biennial conference bringing together all European and some international civil protection stakeholders. The 2015 Forum provided the platform for the official launch of work with neighbourhood countries, as well as the new important work strand on remotely piloted aircraft systems in civil protection. The EU has made exceptional efforts to tackle the Ebola epidemic in West Africa since the beginning of the outbreak in March 2014. Humanitarian aid addressed the most urgent needs in addition to which there was a deployment of emergency supplies and experts through the EU Civil Protection Mechanism. Such measures ultimately led to the defeat of the disease in January 2015. The lessons learned from the Ebola crisis led to the establishment in 2015 of the European Medical Corps in the framework of the EU Civil Protection Mechanism voluntary pool. The third UN World Conference on Disaster Risk Reduction, which took place in Sendai, Japan, in March 2015, adopted a new framework for disaster risk reduction. The Union took a leading role in building an enhanced disaster risk reduction framework, defining further steps to reduce risks and foster disaster resilience, in the context of sustainable development and building on synergies with climate change. The first calls for proposals for the deployment of volunteers under the European Union Aid Volunteers initiative were published in 2015. This will create opportunities for up to 18,000 people to volunteer in operations worldwide by 2020. The European Union and its Member States are leading the international response to the Syrian crisis. The estimated number of Syrian refugees in neighbouring countries and the wider region has reached over 4.5 million, and the number of internally displaced people in Syria is estimated at 6.5 million. In 2015, more than EUR 160 million was allocated from the EU budget to life-saving operations inside Syria. The key strategic priorities focused on supporting multi-sector, rapid, flexible and reactive responses to emergencies in parallel with maintaining regular humanitarian assistance to already displaced and vulnerable populations. Most refugees find refuge in countries and among people who already struggle with poverty and hardship, and therefore host communities in the region are often also beneficiaries of the humanitarian aid provided. The ‘Whole of Syria’ approach is based on a four-pillar strategy that included negotiated access, emergency response, protection, and accountability and support to partnerships. As one of the main donors of the 2015 Strategic Response Plan, the Union helped support 12 million beneficiaries with health assistance, 5 million with protection services, 8 million with water, sanitation and hygiene services and over 6 million vulnerable internally displaced people with shelter and non-food items. The Union also became increasingly involved in international diplomatic initiatives (e.g. the Vienna talks) and advocacy efforts aimed to promote the respect of basic humanitarian principles and international humanitarian law. In Lebanon, in 2015, EUR 97 million was allocated from the EU budget to support some 665 000 people, with a special focus on women and children. Assistance focused on the most vulnerable refugees to address their basic needs through a multi-purpose cash approach, secondary healthcare for life-saving, shelter, and water and sanitation. In addition, specific protection activities were funded, such as counselling and legal assistance to victims of violence. In Jordan, priority was given to the most cost-efficient and effective solutions focusing on the basic needs' approach, through cash assistance totalling EUR 58 million. For instance, the Union supported UNICEF to assist 56 000 girls and boys from the most vulnerable Syrian refugee families with a cash grant of 20 Jordanian dinars per child per month. The immediate objective of this programme was to prevent vulnerable families from relying on negative coping mechanisms such as child labor or eating less to save money, by helping to cover needs and expenses specific to each child. As a result, more than 50% of families reported avoiding the use of at least one negative coping strategy and 91% of the sampled group reported that this improved their overall family well-being. After decades of conflict, vulnerable Iraqis struggle to survive a complex emergency that has entered into its third year. Fighting and sectarian violence have resulted in the displacement of millions of people. Iraq is facing not only the consequences of its internal conflict, but also those created by the conflict in neighbouring Syria. It is hosting hundreds of thousands of registered Syrian refugees. Responding to growing humanitarian needs, the Union significantly increased its humanitarian aid to Iraq, allocating nearly EUR 79 million in 2015. The aim was to provide protection and relief to Iraq’s displaced people, to Syrian refugees and to other vulnerable populations affected by the conflicts. In 2015, Turkey was declared the largest refugee-hosting nation in the world. Over 2.5 million Syrian refugees were registered there at the end of the year. Nearly EUR 36 million was allocated from the EU budget for humanitarian assistance to meet the urgent needs of the most vulnerable. One of the main priorities was the health sector, especially physical rehabilitation/post-operative care for war wounded, and primary healthcare services in acutely underserved areas for about 130 000 people. Another key priority are programmes, reaching about 230 000 people, providing the most vulnerable refugee families with vouchers that enable them to buy basic household items. Furthermore, the European Council on 15 October 2015 welcomed the Joint Action Plan with Turkey as part of a comprehensive cooperation agenda based on shared responsibility, mutual commitments and delivery. The Facility for refugees in Turkey 6 provides substantial new financial resources and a coordination mechanism designed to ensure that the needs of refugees and host communities are addressed in a comprehensive and coordinated manner. The Facility will coordinate a total amount of EUR 3 billion for 2016-2017. In 2015, more than one million people made their journey into the EU, using largely what has become to be known as the 'Western Balkans route', crossing Turkey and then Greece in an effort to reach central and northern Europe. The EU budget also funded emergency humanitarian interventions in the Western Balkans amounting to EUR 22 million to support vulnerable refugees, asylum seekers and migrants in need. This support contributed to the provision of emergency assistance (food, water, hygiene, non-food items, health, basic protection, and winterisation) in places where a high number of refugees was concentrated, including borders and registration points. The Sahel, one of the world’s poorest regions, is reeling from the aftershocks of four consecutive food and nutrition crises since 2005, aggravated by the impact of climate change. These recurrent crises have severely eroded the resilience of the poorest families who struggle to cover their basic food needs year after year, most especially during the long period between harvests. In 2015, funding to the Sahel (Burkina Faso, Cameroon, Chad, Mali, Mauritania, Niger, Nigeria and Senegal) amounted to EUR 229 million with a focus on the food and nutrition crisis. As one of the world’s least developed countries, Chad continues to face a complex emergency as a result of chronic food insecurity, malnutrition, natural hazards, epidemics and massive displacement of populations. EU humanitarian aid for Chad totalled EUR 58 million in 2015, enabling 75 000 households to acquire basic food items through cash grants and vouchers. Decades of political instability and natural disasters in the neighbouring Central African Republic has triggered an influx of refugees putting additional strain on already overstretched resources. In addition to protracted food insecurity, the widespread violence in the north-east of Nigeria due to Boko Haram has prompted a massive exodus. In the course of 2015, EUR 21.5 million was allocated from the EU budget for humanitarian assistance in Nigeria, providing emergency food assistance, health and protection services to displaced people and victims of conflict. Over 2 million Nigerians have been forcibly displaced within the country and over 190 000 have fled to neighbouring Niger, Cameroon and Chad. The humanitarian community expects a new massive wave of displacement, due to ongoing evacuations of resident populations from the Lake Chad islands, as a result of military operations in the area. South Sudan has been plagued by continuous crises that have generated huge humanitarian needs. The EU provides more than 40% of all humanitarian aid funding to South Sudan to support life-saving programmes for an estimated 2 million people. In 2015 alone, it provided EUR 127 million in aid for the country. The armed conflict since December 2013 has left thousands dead and over 2 million uprooted from their homes. A peace agreement was signed in August 2015, but there is still no sign of peace in the country. Political instability and natural disasters, including vulnerability to climate change, in the Central African Republic have contributed to the destruction of the national economy, lack of development and the weakening of state institutions. Since the beginning of the conflict in 2013, the EU has played a leading role in providing EUR 73 million in humanitarian assistance. The situation remains extremely volatile. In 2015, EU humanitarian aid for the Central African Republic totalled EUR 25 million supporting projects covering protection, access to health care, food and nutrition assistance, distribution of clean water, sanitation services, logistics and humanitarian coordination. A high level international conference on the Central African Republic was held in May 2015 which focused on the country’s humanitarian needs, recovery and resilience building. The EU announced a contribution of EUR 125 million to finance emergency actions in countries affected by El Niño in Africa, the Caribbean, and Central and South America. The phenomenon, which is one of the biggest events in the last three decades, exacerbated by climate change, is affecting more than 41 million people worldwide 7 . Ethiopia in particular is one of the country worst hit by the El Niño phenomenon, reporting an increase in the number of food-insecure people due to drought from 2.9 million in January 2015 to 8.2 million in October 2015. Political instability, armed conflicts, poor economic performance and chronic underdevelopment are at the heart of the complex and multifaceted crisis Yemen is facing. Over 47% of the population lives below the poverty line on less than 2 euros a day and the country has the world’s third highest rate of malnutrition. In 2015, EUR 50 million was allocated from the EU budget to assist populations across the country affected by conflict and forced displacement, food insecurity and malnutrition. The bulk of humanitarian funding is used to provide food, water and sanitation, basic healthcare, and shelter and household items for the internally displaced people, the refugees from the Horn of Africa and the communities who are hosting these uprooted people. The EU has kept the humanitarian crisis in Ukraine high on its agenda. Millions of people in Ukraine are in need of humanitarian aid because of the combined impact of conflict, displacement and extreme poverty. Projects implemented in 2015 from the EU Budget totalled EUR 30 million, which directly helped over 800 000 Ukrainians. While the target populations were the most vulnerable children, the elderly and single-parent households, aid also went to internally displaced people and to refugees who had fled conflict areas, as well as to returnees. Assistance often took the form of cash and vouchers, which has been shown to be a highly efficient and effective channel for assistance with the advantage of directly stimulating the local economy as well as helping to preserve the dignity of those affected. In addition, material assistance was mobilised through the EU Civil Protection Mechanism. In January 2015, a joint EU operation organised the airlift and road transport of relief supplies. A devastating earthquake struck central Nepal in April 2015, killing close to 9 000 people and flattening entire villages. EU humanitarian funding of EUR 15 million was immediately released to help address the most urgent needs — emergency shelter, emergency healthcare, water and sanitation, livelihood support, and logistics — and to promote disaster preparedness and risk reduction activities. In the days following the earthquake, the EU Civil Protection Mechanism (EUCPM) was activated upon request of the Nepali authorities. The EUCPM facilitated the deployment of three modules — heavy urban search and rescue, advanced medical posts and water purification — as well as experts in structural engineering, and other technical assistance on top of in-kind assistance and relief teams. The Commission’s sustained advocacy efforts led to the formulation of the National Strategy for Disaster Management in Nepal. The EU also looked beyond the media spotlight to engage in many of the ‘forgotten’ crises 8 . In 2015, these included the Sahrawi refugees in Algeria, the Rohingya people in Myanmar/Burma, and the Colombian refugees in Ecuador and Venezuela 9 . The Forgotten Crisis Assessment identifies serious humanitarian crisis situations where the affected populations do not receive enough international aid or even none at all. These crises are characterised by low media coverage, a lack of donor interest and a weak political commitment to solve the crisis, resulting in an insufficient presence of humanitarian actors. In 2015, the EU allocated almost 17% of its initial humanitarian aid budget to forgotten crises. Children account for half of the victims of conflicts across the world and are among the most vulnerable victim groups. In addition to possible injury and forced displacement, family disruption is a very acute risk during times of crisis. The likelihood of and impact on children of separation from their families are both very high. When a disaster strikes, millions of children have their education disrupted. The impact of conflicts on these children is often long-lasting and can lead, in protracted crises, to situations where the lack of proper education is conducive to perpetuating violence — as these children replicate as adults the violent patterns that they experienced in their childhood. Out of school, children miss the chance to develop the necessary skills to build more prosperous futures for themselves and their countries. In situations of emergency, education can help create at least some sense of normality and safety, and it gives children the psychosocial support they need to overcome traumas. Education is also often identified as a primary priority by affected communities themselves. Education in emergencies became a major priority in 2015. Education is a life-saving humanitarian intervention that has been supported through the EU Children of Peace and other initiatives. From 2012 to 2015, over EUR 23 million has been allocated to educational projects (including contributions from the governments of Luxembourg and Austria), and more than 1.5 million children have benefited from these projects in 26 countries around the world. The Commission has made a commitment to increase the proportion of humanitarian aid funding allocated to education in emergencies from 1% in 2015 (EUR 11 million) to the UN target of 4% in 2016. EU-funded educational activities are tailored to take into account the different needs of children based on their age, gender and other specific circumstances. The actions vary from facilitating access to schools, including catch-up classes, to providing uniforms, teaching material and transport of children to educational centres. The EU also gives funds to rehabilitate damaged schools and construct new learning spaces and centres. Thanks to EU support, access to vocational training and psychosocial assistance is also possible. The unprecedented humanitarian crises in 2015 affected Europe directly through the massive increase of refugees and migrants. Given this, the Union has pushed for strong coordinated efforts of the international community to respond to the humanitarian challenges worldwide, for better disaster risk management and for more involvement of development actors in protracted displacement situations. The first ever multi-stakeholder World Humanitarian Summit, called by the United Nations, took place on 23-24 May 2016 in Istanbul. The Union was at the forefront of supporting and preparing for the summit during 2015. The Union co-organised the preparatory European consultation (Budapest, 3-4 February 2015) and closely followed all other regional consultations as well as the global consultation in October 2015. It contributed to studies led by the UN Office for Coordination of Humanitarian Affairs (OCHA), and supported the work of the Summit's Secretariat. The Commission Communication of 2 September 2015 10 outlined the EU’s priorities for the summit: upholding international humanitarian law; ensuring effective aid delivery; closer humanitarian-development cooperation, including in protracted crises; partnership with local, national and regional actors; and efficient and sufficient humanitarian financing. In terms of international cooperation, the EU continued its privileged dialogues with donors both members and non-members of the OECD Development Assistance Committee. The EU organised its first strategic dialogues with Japan and Australia to explore synergies, discuss issues of global concern and share priorities. The EU also strengthened its cooperation with the Organisation of Islamic Cooperation, the League of Arab States and the United Arab Emirates. One example was a workshop in Jeddah with the Organisation of Islamic Cooperation. The Commission continued to be in the vanguard in civil-military coordination by actively shaping EU military engagements to better respond to the needs of the humanitarian community and to ensure smoother coordination in the field e.g. in the planning and conduct of EUNAVFOR MED operation 'Sophia', the European Union naval force operation in the Mediterranean. The Commission has also actively shaped the approach to the protection of civilians in EU-led military operations so as to reflect humanitarian protection concerns and respect of international humanitarian law. The unprecedented number of forcibly displaced people in the world — 60 million — called for a stocktaking exercise in the second half of 2015. This was led by the relevant Commission services and sought to map out policy initiatives, relevant instruments, actions, lessons learned and gaps at EU level in managing the current refugee crisis. On 26 April 2016, the Commission adopted a Communication on Forced Displacement and Development "Lives in Dignity: from Aid-dependence to Self-reliance" 11 and an accompanying Staff working document 12 . The Communication aims at setting out a new development-oriented approach to support refugees, IDPs, voluntary returnees and host populations in partner countries. During 2015, the Commission, on behalf of the Union, chaired and steered the work of the Food Assistance Convention’s Committee. During the year, work included a joint statement by the Committee for the World Humanitarian Summit. The Food Assistance Committee has evolved into a significant forum for policy debate. In certain humanitarian disasters, the supply of food to markets and shops is maintained, but the affected population loses its purchasing power. In such cases, the 'cash approach' ensures humanitarian aid directly reaches those with the greatest need in a timely manner. Cash transfers are quick to deliver, cost-effective and provide people in need with greater choice. Among its advantages are benefits for local economies, empowerment of beneficiaries, dignity, and decision-making power for people who can choose the items to buy. In March 2015, the Council endorsed a paper on ‘10 common principles for multi-purpose cash-based assistance to respond to humanitarian needs’. The document appraises opportunities for multi-purpose cash-based assistance from both an operational and policy perspective. The alarming increase in displaced populations over the last decade, combined with the continued economic, social and environmental challenges posed by climate change, has greatly increased the need for effective and efficient humanitarian shelter and settlement interventions. As a result, global technical shelter and settlements capacity needs to be upgraded and funds used more effectively to provide greater impact for the growing number of those in need. To capture best practice in this sector, for which up to EUR 180 million is allocated annually, guidelines are under preparation, with the external consultation phase completed in 2015. The delivery of EU civil protection assistance is coordinated by the Emergency Response Coordination Centre (ERCC). The assistance consists of governmental aid from the EU Civil Protection Mechanism’s participating states 13 delivered in the immediate aftermath of a disaster. The ERCC monitors crises around the globe 24/7, ensuring complementary action from the EU and its Member States. The mechanism ensures a well-coordinated response at European level to victims of natural and man-made disasters in Europe and elsewhere, including in cases where the Solidarity clause (Article 222 of the TFEU) is invoked. In 2015, the EU Civil Protection Mechanism was activated for 25 emergencies (pre-alert, monitoring and request for assistance) and received 19 requests for direct assistance within the EU and in other disaster-stricken countries. At the same time, the Commission pursues effective prevention and preparedness policies with Member States. The EU Civil Protection Mechanism provides support to Member States and neighbouring countries facing major peaks in the refugee crisis that overwhelm their immediate response capacities. Since the second half of 2015, Hungary, Serbia, Slovenia, Croatia and Greece have requested assistance through the Mechanism. Fifteen countries have made offers of assistance, and four requests continued to be active into 2016. EUR 490 000 of the EU budget was allocated to co-financing the transport and delivery to the countries affected by the crisis. Serbia, for instance, has been confronted with a massive influx of refugees and migrants in transit from Greece to Hungary or Croatia. To help cope with the refugee influx, in September 2015, Serbia received in-kind assistance from other European countries , in the form of vehicles, fuel, hygiene items, beds, mattresses and food. In-kind assistance has been delivered to Greece in the form of tents, beds, sleeping bags, blankets, hygiene kits, power generators, water pumps, fire-fighting equipment and other specialised equipment. Hungary, Slovenia and Croatia have also received material assistance such as winterised tents, beds and blankets from the Mechanism participating countries to help them better cope with the arrival of refugees and asylum seekers. On 14 January 2016, the World Health Organisation (WHO) declared the end of Ebola transmission in West Africa. From the beginning of the worst Ebola epidemic in history (March 2014), the EU and its Member States rapidly mobilised its political, financial and scientific resources to help contain, treat and ultimately defeat the Ebola virus. With a total humanitarian budget of EUR 71 million since the onset of the epidemic, the EU addressed the most urgent needs by providing support activities including: epidemic surveillance, diagnostics, treatment and medical supplies; deployment of doctors and nurses; training of health workers; and awareness raising among the population. The ERCC played a pivotal role in coordinating the EU response, holding regular coordination meetings of the EU Ebola Task Force, which brought together all relevant Commission departments (HQ and field), the European External Action Service, EU Delegations, EU Member States, UN bodies and the EU’s humanitarian partners. Member States coordinated their activities within the EU in regular meetings of the Health Security Committee established under Decision 1082/13 on serious cross-border threats to health 14 , based on rapid risk assessments prepared by the European Centre for Disease Prevention and Control 15 . Activation of the EU Civil Protection Mechanism enabled the swift coordinated deployment of emergency supplies and experts offered by Member States (more than 100 flights and 2 cargo ships). A medical evacuation system was established to support the mobilisation and ensure the safety of international aid workers. The deployment of mobile labs by the Commission played a pivotal role in diagnosing the population in West Africa on Ebola. In March 2015, the EU hosted the ‘Ebola: from emergency to recovery’ conference. This highlighted the need to keep the momentum to prevent a sharp increase in new cases, and to plan the next steps in the fight both against the then outbreak and any subsequent outbreak of the Ebola virus. The concept of having a 'reserve' of medical and public health teams available to deploy under the EU Civil Protection Mechanism – now known as the European Medical Corps – took shape in 2015, following the lessons learned of the Ebola crisis 16 . Quality and interoperability requirements were defined and expanded in accordance with the new WHO standards for medical modules. The EU Civil Protection Mechanism's "voluntary pool" is thus being expanded with medical teams, public health teams, mobile biosafety laboratories, medical evacuation capacities, and specialised assessment and support teams. The official launch — with a number of available medical response capacities assigned to the voluntary pool — took place on 15 February 2016. Worldwide, natural disasters are growing in frequency, complexity and severity, and are aggravated by challenges such as climate change. Every year, devastating forest fires take place in Europe and around the world, destroying thousands of hectares of forests. When the scale of a fire exceeds the capacity of a country to extinguish it, the EU Civil Protection Mechanism can be activated to bring in coordinated additional resources. The ERCC monitors forest fire risk and incidence across Europe around the clock, using national monitoring services and tools such as the European Forest Fire Information System. In July 2015, Greece requested assistance under the mechanism in fighting dozens of forest fires, and in response, forest fire-fighting aircraft were sent to help. The EU can facilitate the overall transport and logistics coordination in these scenarios and in this case co-financed the transport of assistance to Greece. In 2015, total EU transport co-financing was more than EUR 14 million, as part of the EU's financial support for the transport of assistance offered by EU Civil Protection Mechanism's participating states. The EU Civil Protection Mechanism was also activated to respond to other disasters including floods in the former Yugoslav Republic of Macedonia, Albania, Myanmar/Burma and Bangladesh, forest fires in Paraguay and the earthquake in Nepal. Prevention and preparedness reduce the worst impacts of human and natural disasters, and can support more effective adaptation against the impacts of climate change. An example of a successful civil protection exercise is the scenario of a major accident conducted in an industrial area in Oslo in April 2015. The exercise staged a ship collision, and a fire at a tank farm that resulted in an explosion and the spill of hazardous substances. The aim of the exercise was to test the emergency and rescue response and decision-making procedures. Participants included the Norwegian emergency services, Oslo municipality, the county governor, regional and national authorities, and European and international teams and experts from the ERCC. Following the adoption of the EU Civil Protection Mechanism legislation and the Implementing Decision in October 2014, 2015 was marked by the speedy implementation of the European Emergency Response Capacity in the form of a voluntary pool of Member States’ response capacities. Interested participants under the EU Civil Protection Mechanism can pre-commit various types of response capacities to the voluntary pool for use in coordinated EU civil protection missions. The voluntary pool enables improved planning of rapid response actions and flexible standby arrangements. By the end of 2015, 21 modules and other response capacities had been registered in the voluntary pool. The capacity goal of the voluntary pool is 41 modules by 2020. The Commission continues its international outreach to strategic civil protection partners around the world (China, Japan, USA, ASEAN, etc.) and its ongoing work with EU candidate and potential candidate countries. In addition to this, in 2015, the Commission developed a new form of cooperation with European neighbourhood countries, in the context of the review of the European Neighbourhood Policy 17 . A form of associated partnership will be offered to a number of neighbourhood countries in order to increase their capacity to cooperate on disaster management under the EU Civil Protection Mechanism. 2015 also saw the most successful edition of the European Civil Protection Forum, the large biennial conference bringing together all European and some international civil protection stakeholders. The 2015 Forum provided the platform for the official launch of work with neighbourhood countries, as well as the new important work strand on remotely piloted aircraft systems in civil protection. In addition, the Commission has been actively involved with Member States in the development of national risk assessments. This arises from the requirement of the EU Civil Protection Mechanism for participating countries to submit national risk assessment reports to the Commission by December 2015. Risk assessment is also being addressed as part of a global initiative to develop the INFORM index for risk management in cooperation with the Inter-Agency Standing Committee and many other international partners. INFORM 2015, which covers 191 countries, was launched early in 2015 and helped the Commission in supporting decision-making processes and funding allocations. The Disaster Preparedness ECHO programme (DIPECHO) aims to reinforce in-country preparedness capacities so that early action can be taken to reduce hazard impacts, and asset and human losses, and to respond to humanitarian needs. The programme is fully integrated in the humanitarian aid financing framework. All Humanitarian Implementation Plans 18 incorporate an analysis of options and priorities for preparedness, early action and disaster risk reduction. On average, every euro spent on reduction and preparedness activities saves between four and seven euros that would be spent to respond in the aftermath of a disaster. In 2015, actions under the programme also strengthened local response capacities by investing in early warning systems, providing training to local authority officials, establishing and developing local disaster management committees, organising simulations, etc. In 2015, close to EUR 38 million was allocated to the DIPECHO programme, increasing the number of direct disaster risk reduction beneficiaries from 16 million to 24 million worldwide. Disaster risk reduction activities were mainstreamed in 43% of all humanitarian operations last year. These efforts are also expected to contribute to adapting to the impacts of climate change. The EU has taken a leading role in building a robust, ambitious and enhanced framework for Disaster Risk Reduction in 2015. The EU played a very significant role at the third United Nations Conference on Disaster Risk Reduction, which adopted the Sendai Framework for Disaster Risk Reduction 2015-2030 in May 2015. Disaster risk reduction is now firmly anchored as a key element of sustainable development efforts, focussing on the international community's ability to reduce risks and enhance disaster resilience. Addressing the interlinked challenges of disaster risk, sustainable development and climate change is recognised as an important guiding principle. The adoption of this new framework establishes clear targets and priorities for action that will lead to a substantial reduction of disaster risk and of losses in lives, livelihoods and health. Implementation of the Sendai Framework over the next 15 years will require commitment and political leadership. The Commission is following up on the Sendai Conference with an action plan on the implementation of the new international framework 19 . The Union will be playing an active role in the intergovernmental expert working group established to develop global indicators to measure global progress on the implementation of the Sendai Framework. The Commission will be playing an active role in the intergovernmental expert working group established to develop global indicators to measure global progress on the implementation of the Sendai Framework. The EU Aid Volunteers initiative aims to bring together, between 2014 and 2020, up to 18 000 volunteers from EU Member States to support the EU’s efforts to strengthen the capacity and resilience of vulnerable communities in other countries. The initiative provides opportunities for capacity building and technical assistance for organisations sending and hosting volunteers. The first calls for proposals were launched in 2015. Ten projects have been selected for co-funding: four for technical assistance and six for capacity building in areas such as disaster risk management, volunteer management, capacity to undergo certification, tools and methods of needs assessment, building partnerships, and communication activities. Altogether, 88 organisations are involved in the implementation of projects. The first concrete results from the preparatory and initial implementing actions are expected in 2016 when trained volunteers will be deployed to humanitarian projects worldwide. All organisations wishing to send or host volunteers under the initiative must be certified. The certification process verifies that the high standards and procedures of volunteer management, set to protect and manage volunteers during their deployment, can be fully realised and met by all participating organisations. In January 2015, a call for applications was published to establish a list of certified sending and hosting organisations. Sixteen certifications were awarded by the end of 2015. The certification is an ongoing process and the call is open until 30 September 2020. The selection, preparation and deployment of volunteers are the main actions under the initiative. A call for proposals was published in July 2015 for deployment of volunteers. By October 2015, two applications had been submitted involving 27 organisations and the deployment of 44 volunteers after summer 2016. The evaluation of the applications and the signature of the grant agreements will be finalised in 2016. An open call for tenders for training was published in October 2015. The objective is to provide training services to candidate volunteers and to assess their competence and abilities. The evaluation of the applications and the signature of the framework contract(s) are to be finalised in 2016. The Commission's Education, Audio-visual and Culture Executive Agency (EACEA) is in charge of the complete life-cycle management of the EU Aid Volunteers initiative. This consists of the implementation of the programme including the call for proposals, analysis of the grant requests, certification process, on-the-spot monitoring of projects, and the dissemination of the projects' and programme's results. The Commission holds responsibility for the development of the legal framework at the base of the EU Aid Volunteers initiative and maintains key oversight for policy, financial and operational elements of the initiative. The EU attaches great importance to the link between humanitarian aid, as a rapid response measure in crisis situations, and other EU instruments prioritising more long-term development and reconstruction efforts. The humanitarian-development nexus is complex and requires increased coordination — leading to joint approaches between Commission services, and collaborative implementation, monitoring and tracking of progress. The need to further invest in this approach was reaffirmed in 2015 with the publication of the EU Resilience Compendium. The aim of this publication is to foster learning and a better understanding of how resilience can lead to more effective humanitarian assistance and transformational change for the most vulnerable in the long term. The compendium highlights how resilience principles are already incorporated in many EU programmes, such as for climate adaptation and for social protection. The Compendium was launched at the third UN World Conference on Disaster Risk Reduction, which took place in Sendai, Japan, in March 2015. The EU’s "Supporting the Horn of Africa’s Resilience" (SHARE) and the "Global Alliance for Resilience" (AGIR) are flagship joint initiatives of Commission services. They aim to improve the ability of people, communities and countries to face persistent and acute emergencies in the eastern Horn of Africa and the Sahel in West Africa. To that end, it is crucial for development actors, governments and international aid organisations to work together to break the cycle of emergencies. The momentum created by both initiatives prompted nine countries in the regions to adopt national resilience priorities by 2015. In July 2015, Commission services co-organised a seminar with the objective to update humanitarian and development practitioners working in/on fragile and crisis-affected countries on recent policy developments, as well as on concepts, principles, approaches, tools and procedures for better addressing fragility and crisis situations with a resilience lens to avoid deterioration and ensure a smoother transition from humanitarian to development. Commission services and EU Delegations are also working closely on the joint EU initiative "Resilience Building in Ethiopia" (RESET). This is implemented in drought-prone areas of the country. The initiative addresses not only the symptoms of extreme poverty but also some of the root causes of food insecurity and malnutrition. In so doing, it provides households with greater coping capacity to resist future shocks. In December 2015, the Commission adopted RESET II 20 , an Action Plan for Ethiopia integrating the specific objectives and scope of the EU Trust Fund. The EU Emergency Trust Fund for Africa was launched at the Valletta Summit on Migration on 12 November 2015 by European and African partners. The Trust Fund will assist countries in the Sahel region, the Lake Chad area, the Horn of Africa and North Africa that are among the most fragile and affected by migration. The Trust Fund pools together money from different EU financial instruments, supplemented with additional funds from EU Member States and other donors. The Trust Fund aims to tackle the root causes of irregular migration and displacement in countries of origin, transit and destination, through a range of priority sectors: economic programmes, migration management, stability and governance, and resilience. Resilience projects support basic services for local populations, and in particular the most vulnerable, as well as refugees and displaced persons, including through community centres or other means of providing them with food and nutrition security, health, education, and social protection, as well as environmental sustainability. The newly established Bekou Trust Fund aims to promote the stabilisation and reconstruction of the Central African Republic. It focuses on linking relief, rehabilitation and development, and on resilience. Contributions come from the European Development Fund, the Development Cooperation Instrument, EU Humanitarian Assistance and from EU Member States' programmes. Actions funded by the Bekou Trust Fund also complement activities under the EU Instrument contributing to Stability and Peace. The Fund was established in July 2014 by the Union and three Member States: France, Germany and the Netherlands, which were joined in 2015 by Italy and Switzerland. In 2015, the Bekou Trust Fund focused on three components; 1) the resilience of communities in terms of food security through the deployment of "resilience boxes" based on an integrated system of "farmer-field schools"; 2) the accompaniment of pastoral activities through the reorganisation of transhumance networks and the development of veterinary services; and 3) the establishment of food, vegetable and small livestock sectors in Bangui in close collaboration with local authorities. In addition, the increasing vulnerability and exposure of people and assets, and the frequency and severity of hazards, are pressing reasons to search for innovative ways to exploit the use of science and technology to their full potential. For example, the Commission supported urgent Ebola research on potential treatments, vaccines and diagnostic tests with funds of almost €140 million, leveraging an additional €100 million from the pharmaceutical industry. The Global Research Collaboration for Infectious Disease Preparedness (GloPID-R) was set up with the support of the EC. It brings together funding organisations on a global scale for an effective research response to major outbreaks of infectious diseases with pandemic potential. It has proven its value in the Ebola outbreak as well as the Zika outbreak. The European and Developing Countries Clinical Trials Partnership (EDCTP) brings European and African countries together with the aim of developing new interventions (diagnostics, drugs, vaccines) against HIV/AIDS, Malaria and Tuberculosis (EU contribution EUR 683 million). A number of dedicated research and innovation actions on addressing the migration phenomenon have been funded by Horizon 2020 including through the recent call on migration, radicalization, integration (EUR 7.5 million). In 2015 the European Commission launched the science4refugees initiative for matching refugees and asylum seekers who have an academic background with European academic institutions and interested industries. 224 research organisations have flagged job vacancies for refugees and 42 refugee researchers have already registered. As regards science and technology cooperation with developing countries, the emphasis is on building partnerships. For example, during 2015 the first important steps were made towards the development of an EU-Africa Research and Innovation Partnership on food and nutrition security and sustainable agriculture (FNSSA). Around EUR 70 million is already being invested in it by the European Commission, European member states and African countries. the need to promote knowledge sharing as it is key to enhancing the science/knowledge-policy interface. emergency actions in countries affected by the extreme weather phenomenon El Niño in Africa, the Caribbean, and Central and South America. In the course of 2015, the Commission took further advantage of the new funding options under Article 21(2)(b) 21 of the 2012 Financial Regulation, 22 making greater use of external assigned revenues, which allow EU Member states and other donor organisations to delegate the management of some of their funds to the European Commission, for a more streamlined approach to aid management in some sectors and countries. The largest external revenues came from the United Kingdom and France. 1% for a direct contract of ECHO flight and a contract with Noha University. As in previous years, actions in Africa received the most substantial funding in 2015, followed by the Middle East with a special focus on the Syria crisis. Approximately 98% of the 2015 humanitarian and civil protection budget was used for operational activities and the remaining 2% for administrative and policy activities. There are 344 staff members working in Brussels headquarters, and over 465 humanitarian expert staff in 48 field offices located in those countries most severely affected by crises in Africa, the Middle East, Asia, Latin America and the Western Balkans. The worldwide network of field offices enables up-to-date analysis of existing and forecast needs in a given country or region, to ensure the monitoring and support of activities and coordination with other donors and implementing partners in the field. Bring the regional offices closer to the field, by transforming the 6 Regional Support Offices into 12 Regional Offices. In addition, at the end of 2015, the Commission established its presence in Belgrade in response to the refugee crisis. • Coastal West Africa, 2008 – 2014 (CWA) 24 : The situation for humanitarian assistance in Coastal West Africa is complex, consisting of a mixture of natural and man-made disasters, and often requiring sudden and small-scale responses. The most prominent subjects of intervention are epidemics (including Ebola), floods, and conflicts. • Sahel Strategy, 2010 – 2014 25 : The Sahel has some of the highest acute malnutrition rates in children worldwide. Levels of acute malnutrition are one of the most important indicators used to identify humanitarian crises. They reflect the overall status of the most vulnerable populations and provide information, inter alia, on access to food, the capacity of coping mechanisms and functioning of the public health system. • Syria, 2012 – 2014 26 : Since March 2011, the violent crackdown of the protests in Syria and the ensuing protection crisis has progressively developed into a widespread non-international armed conflict, with severe humanitarian consequences in Syria and its neighbouring countries. From a widespread guerrilla fare, the conflict has evolved towards a full-fledged civil war. Large portions of the territory have fallen under the temporary or permanent control of numerous Armed Opposition Groups, particularly in the North and the East of the country. • Pakistan, 2010 – 2014 27 : Pakistan faces economic difficulties, underdevelopment, political instability, armed conflicts and insecurity in many geographical areas. 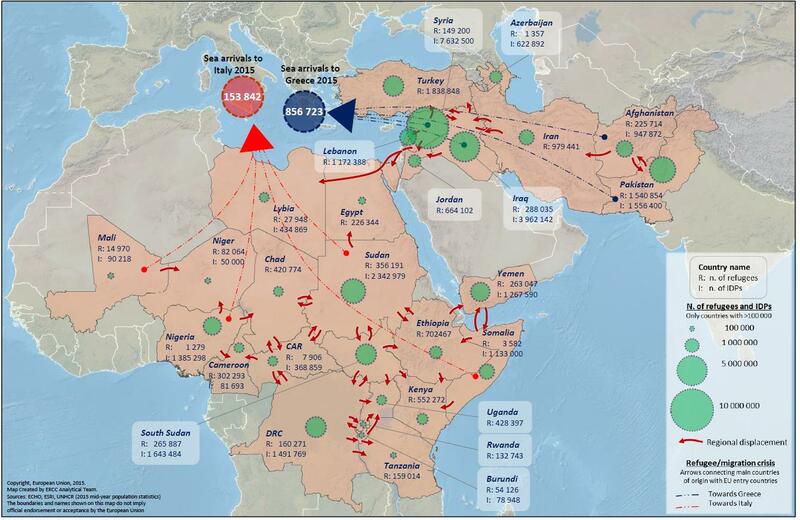 Military operations result in huge population movement. The Commission has classified the protracted IDP crisis in the areas bordering Afghanistan in the northwest as a Forgotten Crisis 28 . • Transfer Modalities, 2011 – 2014 29 : In the last 10 years the humanitarian system has gradually shifted from a pure in-kind support to affected people in emergencies and crises, to include also transfers of cash and vouchers. Cash, vouchers and in-kind support are different so-called ‘transfer modalities’ used in humanitarian response. In the last few years the EU has pursued and encouraged an increased use of the cash modality, as this brings about more dignity, choice and flexibility to the beneficiaries. Furthermore, it has a potential of greater efficiency, value for money, and ultimately improved effectiveness. The Commission’s Humanitarian evaluations follow a standard research methodology that ensures a sound evidence base for responding to the evaluation questions. Firstly, a literature review is carried out, covering reference documents, context related documents, project documentation, existing project evaluations (etc.). Secondly, main stakeholders are consulted, using the most appropriate research tools (e-surveys, interviews, phone interviews, etc.). Main stakeholders are end-beneficiaries, the Commission’s implementing partners, Commission staff at headquarters and field, other main humanitarian donors, government representatives of beneficiary countries, etc. As the evaluations carried out in 2015 will all feed into overarching evaluations (notably on humanitarian aid and the Civil Protection mechanism), not all the Better Regulation requirements applied. For example, no Open Public Consultation was carried out in the context of these evaluations. More detail on the methodology applied for each evaluation, including on assessing efficiency, and their limitations can be found in the evaluation reports. The relevance of the Commission’s actions during the period was generally confirmed by the evaluations examined. The targeting of the most vulnerable groups was largely appropriate and duly informed by systematic needs assessments, including proper involvement of the beneficiaries. Based on the EU mandate, there was a strong focus on relief and rehabilitation, duly taking account of gaps in response left by other donors as well as specific sector needs. The evaluation results show that the Commission’s actions were coherent with key humanitarian principles (“humanity”, “neutrality”, “impartiality”, “independence”, “protection” and “do no harm”). However, it also came clear that it can be challenging to reconcile the humanitarian principle of independence with ensuring coherence with national policies and practices, as the latter are often driven by political or economic considerations, thus creating incoherence with the Commission’s principled and needs based approach. Coherence with DEVCO actions expresses itself mainly as LRRD, which has been manifested in an overall positive manner in CWA and the Sahel, resulting to a certain extent in aligned priorities and programming. To be mentioned is that the evaluation on Pakistan highlights lacking coherence with DEVCO, showing weak links between priorities and programming between the two DGs. The Syria evaluation states that the Commission has a robust system of procedures in place that ensure consistency with the broad spirit of the Good Humanitarian Donorship (GHD) initiative. This has resulted in need-based funding decisions at project level, leading to the widespread appreciation of the Commission as a principled humanitarian donor. However, at strategic level, the Commission’s Humanitarian Implementation Plans for the Syrian crisis over the period 2012-2014 do not explicitly refer to the 23 GHD Principles. Specific requirements are placed on Commission partners to meet the principles of impartiality (GHD Principle 2) and to encourage consistency with LRRD norms (GHD Principle 9). The Commission takes the role of a reference donor, basing its actions on the humanitarian principles, informed assessments, and promoting a non-political approach to humanitarian assistance. The importance of this for maintaining the humanitarian space is well recognised (e.g. as particularly shown in the Pakistan evaluation). The principled and needs based approach includes addressing ‘forgotten crises’ as shown e.g. in CWA, where The Commission was present in every humanitarian situation, in forgotten areas with a variety of adapted funding tools, where other donors were absent. In larger crises the Commission consistently advocated responding to situations where other donors were not present and often played the role of coordinator and catalyst. The Commission’s financial weight enables it to exercise policy leadership and impose a more coordinated and coherent approach on implementing partners. An example is provided by the evaluation of Transfer Modalities, which shows that, partly as a result of the Commission’s capacity building initiatives and evidence based funding strategies, cash transfers are an increasingly common element of humanitarian response, which supports the efficiency and effectiveness of humanitarian aid delivery. Furthermore, the Commission’s strong field presence allows for a comprehensive understanding of the complex needs on the ground, and its neutrality provides greater flexibility and power to act on behalf of the most vulnerable. This is particularly shown in the Sahel and CWA. The Commission is valued by other donors for its technical know-how and capacity for coordination. The possibility of the use of the European Development Fund 30 / ‘Envelope B’ offers a window of opportunity of a joint EU Added Value, assuming that this funding tool would help to coordinate joint programming between the Commission’s humanitarian aid and development actions. However, some evaluation results (particularly for Pakistan) pointed at a lacking exploitation of this potential EU Added Value, as humanitarian aid project results could sometimes be better promoted and picked up by development actions if a better alignment of priorities and programming (“LRRD”) would be made. In Pakistan some partners felt that the Commission could better use its weight and position to put pressure on governments, and advocate for better humanitarian access and key issues affecting the humanitarian community. For CWA the evaluation confirmed the overall effectiveness of Commission funded operations. The Commission funded critical sectors, mobilised partners and supported the overall capacity of the humanitarian system. However, DRR received little support from the Commission (and other donors), considering that DRR strategies, programmes and activities are very relevant for the region, and a clear focus on preparedness is needed. As for Sahel, the evaluation showed that infant mortality declined over the evaluated period. Overall, the Commission’s most significant contribution was to increase the coverage of health centres offering nutrition treatment and the number of children under 5 screened and treated. Furthermore, the Sahel Strategy played a very important role in linking relief to rehabilitation and development (LRRD), and there are a number of examples of successful cooperation with the Commission’s development actions and other actors in this respect. As for the hand-over of the Commission’s humanitarian aid results to governments, there have also been notable changes in the governments’ acceptance of malnutrition as a pathology and an issue to be addressed at national level. Yet, LRRD should be further strengthened in the region to promote impact and sustainability, which is a subject of recommendation by the evaluators. The Commission’s decision to support remote management operations inside areas of Syria controlled by armed opposition groups, whilst simultaneously acting to mitigate the risks of doing so, enabled it to provide effective life-saving assistance to some of the most vulnerable populations in hard-to-reach areas. Taken in tandem with the Commission’s assistance inside government-held areas, its engagement with remote management operations allowed the Commission to provide impartial and needs-based assistance under difficult circumstances. The Commission’s note on Remote Management 31 is still seen by many partners as leading the policy agenda on this issue. A review of Commission-funded operations inside Syria suggests that the note has been widely followed by all partners. In Pakistan the Commission was – in the vast majority of cases – able to achieve its purpose and fund partners to deliver outputs they would have been unable to provide without EU funding. The support funded by the Commission on nutrition in the Sindh Province was considerable and helped to highlight a long-standing problem of chronic malnutrition that was identified at the time of the 2010 flood response. The Commission also helped to involve other donors as well as DG DEVCO, which looked at the root problems of malnutrition in this area. However, the evaluation also came across certain criticism from partners to the Commission in terms of the timeliness of its funding, which is a precondition for an effective and meaningful response. Furthermore, a limited coordination with other Commission services and the National Disaster Management Authority impacted the Commission’s ability to effectively promote longer-term perspectives of humanitarian aid and LRRD in Pakistan. Although an approach to assess cost-effectiveness of humanitarian aid is currently being developed, the Commission does not yet have such an approach available, and evaluators have so far been struggling to provide solid statements on this issue. For Syria the evaluators concluded that the Commission has generally provided a logical rationale for the sub-allocation of funds to the countries within the region – with the possible exception of Turkey’s low share of the burden, the Commission’s Syria team has used a relatively small budget to promote an ambitious set of strategic objectives and exert larger-than-expected influence on the overall response. In part this has been achieved through good collaboration with other EU funding instruments to allow more targeted use of the humanitarian budget. However, the link between the Commission’s funding decisions and beneficiary needs in Syria is opaque and appears to have been sensitive to political influence. For Sahel the evaluators could state with a reasonable degree of confidence that money was well spent, given the contribution of the Sahel Strategy to reducing mortality. However, it was hard to say whether the results could have been achieved with less funding. Inevitably, lessons were generated (e.g. around the efficiency of specific large-scale projects and gaps in the current programme) and these could be used to further improve efficiency. In CWA, the evaluation confirmed the efficiency of the ‘multi-country/cross-border approach’, which enabled Commission partners to better assist populations moving back and forth between two countries, given their knowledge of the context, capacities and constraints on both sides of the border. The inclusion of such cross-border dynamics is bound to reinforce the capacity of the communities on both sides of the border to absorb shocks (resilience). Furthermore, for Côte d’Ivoire (where the larger part of the budget was allocated in CWA during the period), given the situation created by the crisis and the number of people affected (5.9 million were registered in 2012 in the most affected western regions; nearly 4 million people are thought to be living in the 2 most affected quartiers in Abidjan), it can reasonably be concluded that the Commission – the main humanitarian donor – has achieved a very high cost-effectiveness ratio, based on the lack of reported excess mortality and the effectiveness of the livelihoods and social cohesions approaches. Overall for CWA, even if a cost-effectiveness comparison was not possible due to the lack of comprehensive and comparable data, the evaluation team judged the level of effectiveness to be proportionate to the resources invested and the capacity of partners to respond. Resources mobilised were adequate to the needs – particularly in terms of re-establishment of health services and supplies, but also for social cohesion or protection. Concerning Pakistan, both the qualitative and quantitative outputs from EU funding have been satisfactory with regard to pre-defined targets. At the same time, EU funding allows partners to use a range of approaches, rather than a one-size-fits-all approach: food or cash for work, cash vouchers, direct delivery systems involving the beneficiaries and very often district authorities were used. The Commission promoted, funded and used a consortium approach with 2 consortiums, one of which the Commission pushed to be set up with 6 major international NGOs working together and 100% funded by the Commission during this period. This was to help improve delivery, use economies of scale in terms of common usage of assets and ensure standards using the best of each of these organisations’ approaches and to reduce the level of overheads, improving efficiency. However, the criticism of heavy bureaucracy from some partners still hangs over the Commission in Pakistan, which is something to consider when assessing the efficiency of Commission-funded interventions. As for the choice of Transfer Modality – which has a strong bearing on cost-efficiency and cost-effectiveness – the Commission promoted the use of cash transfers over the period. The evaluation of Transfer Modalities (as well as the one on Syria) confirmed that the EU policy was relevant, i.e. that having used cash transfers in certain contexts and circumstances raised efficiency of Commission-funded actions. The Commission should devote further funding to Disaster Risk Reduction (DRR) and/or Linking Relief and Rehabilitation to Development (LRRD), to increase impacts and sustainability of its actions. Synergies between humanitarian aid and development actions should be promoted to reduce the pressure on limited humanitarian funding, without compromising the Humanitarian Principles. This should be combined with strengthened advocacy efforts towards governments, development actors and other donors, with the purpose of ensuring a good take-up and continuation of the Commission’s results. The Commission should further promote the use of cash transfers to meet basic needs at scale. The Commission will look at these recommendations and identify follow-up actions where necessary. (2) With regards to the external dimension of his actions, the Commissioner contributes to the work of the High Representative of the Union for Foreign Affairs and Security Policy/Vice-President, who is responsible for steering and coordinating the work of all Commissioners in the realm of external relations. This approach fully takes into account the special modus operandi of humanitarian aid, which must be provided in accordance with humanitarian principles and international humanitarian law, solely on the basis of the needs of affected populations, in line with the European Consensus on Humanitarian Aid. (3) Council Regulation (EC) No 1257/96 of 20 June 1996 concerning humanitarian aid (OJ L 163, 2.7.1996, p. 1). (4) Decision No 1313/2013/EU of the European Parliament and of the Council of 17 December 2013 on a Union Civil Protection Mechanism (OJ L 347, 20.12.2013, p. 924). (8) Forgotten crises are defined as severe, protracted humanitarian crisis situations where affected populations are receiving no or insufficient international aid and where there is no political commitment to solve the crisis, due in part to a lack of media interest. This refers primarily to protracted conflict situations, but can also refer to crises resulting from the cumulative effect of recurring natural disasters, or, even a combination of the two. (9) The Forgotten Crisis Assessment exercise for 2015 identified 10 forgotten crisis situations: Algeria — Sahrawi Refugee Crisis; Bangladesh — Rohingya refugee crisis and Chittagong Hill Tracts; Cameroon; Chad; India — conflicts in Jammu and Kashmir, central India (Naxalite insurgency) and in the north-east of India; Myanmar/Burma — Kachin conflict and Rakhine crisis; Pakistan; Sudan; Yemen; Colombia crisis — population affected by the internal armed conflict in Colombia and Colombian refugees in Ecuador and Venezuela. (18) The Commission adopts yearly a 'Worldwide Decision' which covers all humanitarian aid actions which the Union anticipates to fund during a given period. In the context of this Decision, the Commission prepares and publishes "Humanitarian Implementation Plans" which provide more detailed information on the operational priorities identified. Member States and non-EU countries, including their public agencies, entities or natural persons, may provide the Commission with revenue assigned to certain external aid projects or programmes financed by the Union. Regulation (EU, Euratom) No 966/2012 of the European Parliament and of the Council of 25 October 2012 on the financial rules applicable to the general budget of the Union (OJ L 298, 26.10.2012, p. 1). (23) International Committee of the Red Cross, International Federation of Red Cross and Red Crescent Societies, International Organisation for Migration. (32) For civil protection, the figures in the table are not broken down by country/region.